Price to earnings ratios suggest that stock markets are overvalued and in need of price adjustment, say GMO's Jeremy Grantham and James Montier. This story originally appeared in Business Insider. After meandering higher for most of the year, the stock market is now sputtering. That’s triggering chatter about a minor “correction,” which many people believe is long overdue. And maybe that’s what we’re at the start of — a minor “correction.” Or maybe this is just a blip and the brilliant and prudent Jeremy Grantham is right that we’re on the cusp of a new bubble that will take the S&P 500 up another 10 percent to 15 percent over the next year to 2,250. (As a stockholder, I sure hope so!) Or maybe we’ll get both—a minor “correction” and a new bubble spike. Or maybe we’re just in the middle years of a fantastic bull market. I don’t know. (Neither does anyone else, by the way.) I’m also not predicting a crash. One thing I do know, though, is that stocks are extremely expensive on every valid historical measure I know of. In the past, this level of overvaluation has presaged poor long-term returns. So I’m not expecting my retirement account to do well from this level over the next 7-10 years. The other thing that this level of valuation has also often preceded is something much worse than a “minor correction”—a crash. And there are other things that are happening now that have also preceded crashes. So I would not be surprised to see stocks fall ~50 percent from this level in the next few years. And, if that happens, you shouldn’t be surprised, either. A crash of that magnitude wouldn’t even make stocks “cheap.” It would merely take them back to their long-term average. And to deny the possibility that stocks might someday drop back to their long-term average seems the height of delusion to me. And it’s not just price that concerns me. Below, I’ll address those one at a time. Lest you be concerned that I’m just “talking my book,” I should be clear about one thing: I own stocks, and I’m not selling them. (For many reasons, including that I’m a long-term investor). From a personal finance perspective, I would like nothing more than for the market to keep going up. I also want to point out one new thing that is worrying me lately: The rise of investor margin debt. Money is cheap right now, and the stock market has been going up for 5 years. As a result, lots of investors are borrowing money to buy stocks. This, in turn, is making stocks go up more, which encourages more investors to borrow more money to buy stocks. And so on. 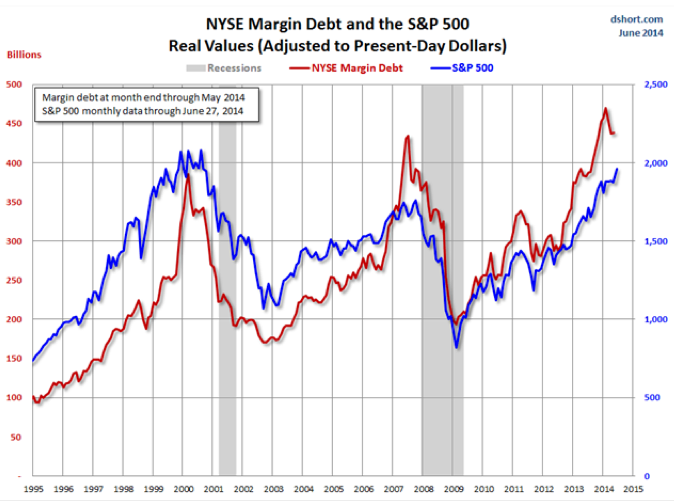 As you can see in this chart from Doug Short, investor margin debt (red) is now higher than it was just before each of the two recent crashes, both of which took stocks down ~50 percent. The problem with margin debt is that the cycle is just as self-reinforcing on the downside. Once stocks drop, investors are forced to sell stocks to meet margin demands. That selling causes stocks to drop more. And so on. Basically, if and when stocks reverse course, conditions are ripe for them to fall a long, long way before anything begins to prop them up. In the past year or two, stocks have moved from being “expensive” to “very expensive.” In fact, according to one historically valid measure, stocks are now more expensive than they have been at any time in the past 130 years with the exception of 1929 and 2000 (and we know what happened in those years). The chart below is from Yale professor Robert Shiller. It shows the cyclically adjusted price-earnings ratio of the S&P 500 for the last 130 years. As you can see, today’s PE ratio of 26X is miles above the long-term average of 15X. In fact, it’s higher than at any point in the 20th century with the exception of the months that preceded the two biggest stock-market crashes in history. Does a high PE mean the market is going to crash? No. Sometimes, as in 2000, the PE just keeps getting higher. For a while. But, eventually, gravity takes hold. And in the past, without exception, a PE as high as today’s has foreshadowed lousy returns for the next 7-10 years. While we’re at it, please note something else in the chart above. Please note that, sometimes—as in the entire first 70 years of the last century—PEs (blue line) can be low even when interest rates (red line) are low. That’s worth noting because, today, you often hear bulls say that today’s high PEs are totally justified by today’s low interest rates. Even if this were true—even if history did not clearly show that you can have low PEs with low rates—this argument would not protect you from future losses, because today’s low rates could eventually regress upwards to normal. But it’s also just not true that low rates always mean high PEs. 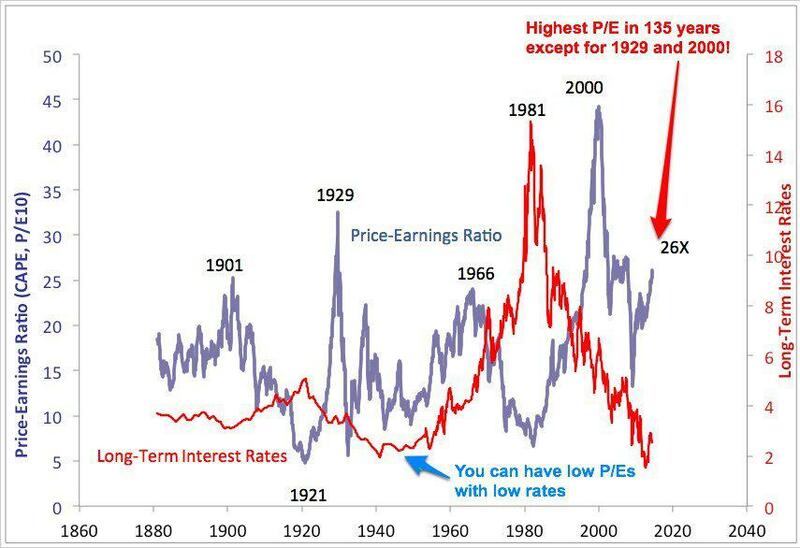 And in case some of your bullish friends have convinced you that Professor Shiller’s P/E analysis is otherwise flawed, check out the chart below. 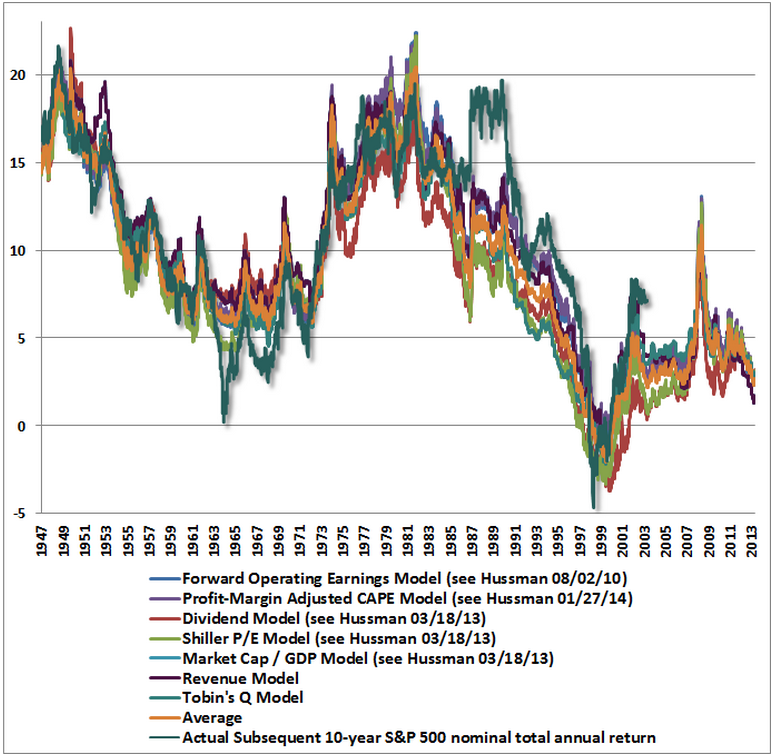 It’s from fund manager John Hussman. It shows six valuation measures in addition to the Shiller PE that have been highly predictive of future returns. The left scale shows the predicted 10-year return for stocks according to each valuation measure. The colored lines (except green) show the predicted return for each measure at any given time. The green line is the actual return over the 10 years from that point (it ends 10 years ago). Today, the average expected return for the next 10 years is slightly positive — just under 2 percent a year. That’s not horrible. But it’s a far cry from the 10 percent long-term average. Montier’s chart shows that another of the common arguments used to debunk Professor Shiller’s PE chart is bogus. Bulls often say that Professor Shiller’s PE is flawed because it includes the crappy earnings year during the financial crisis. Montier shows that this criticism is misplaced. Even when you include 2009 earnings (purple), Montier observes, 10-year average corporate earnings (blue) are well above trend (orange). 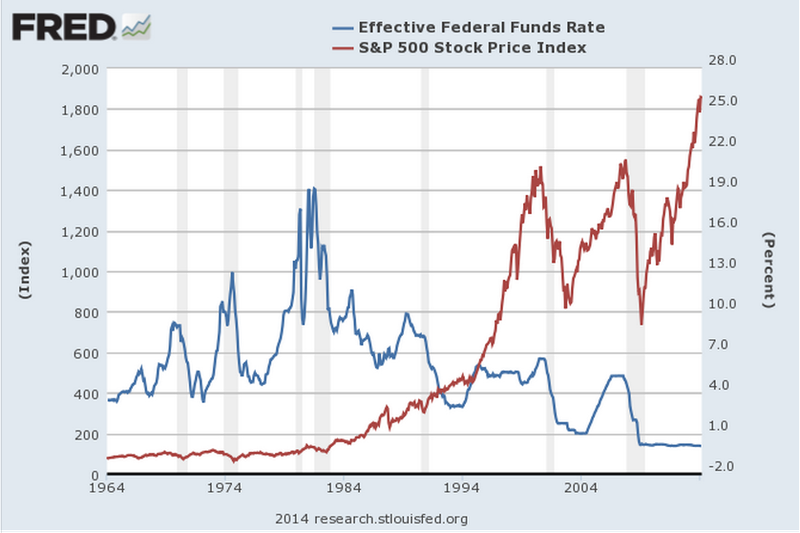 This suggests that, far from overstating how expensive stocks are, Prof. Shiller’s chart might be understating it. In short, Montier thinks that all the arguments you hear about why today’s stock prices are actually cheap are just the same kinds of bogus arguments you always hear in the years leading up to market peaks: Seemingly sophisticated attempts to justify more buying by those who have a vested interest in more buying. That’s price. Next comes profit margins. One reason many investors think stocks are reasonably priced is that they are comparing today’s stock prices to this year’s earnings and next year’s expected earnings. In some years, when profit margins are normal, this valuation measure is meaningful. In other years, however — at the peak or trough of the business cycle — comparing prices to one year’s earnings can produce a very misleading sense of value. Profit margins tend to be “mean-reverting,” meaning that they go through periods of being above or below average but eventually—sometimes violently—regress toward the mean. As a result, it is dangerous to conclude that one year of earnings is a fair measure of long-term “earning power.” If you look at a year of high earnings and conclude these high earnings will go on forever, for example, you can get clobbered. Have a glance at this recent chart of profits as a percent of the economy. Today’s profit margins are the highest in history, by a mile. Note that, in every previous instance in which profit margins have reached extreme levels like today’s—high and low — they have subsequently reverted to (or beyond) the mean. And when profit margins have reverted, so have stock prices. 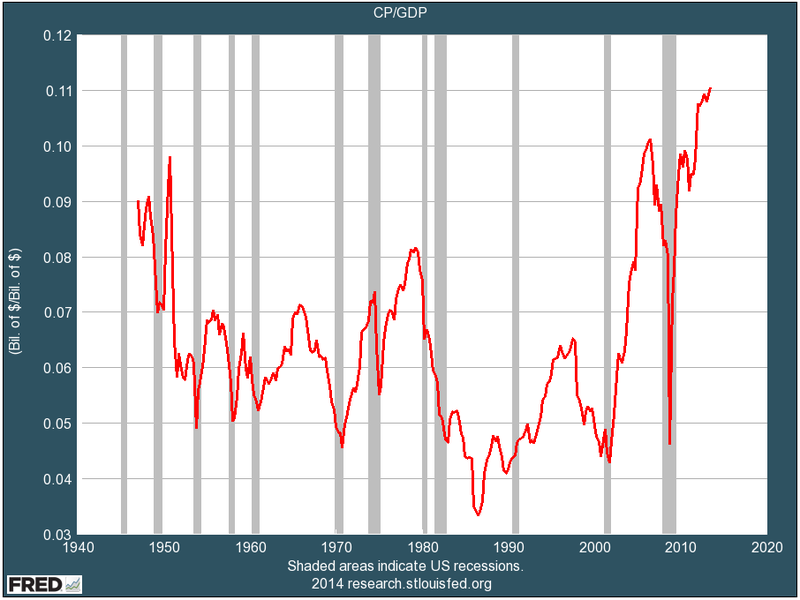 After-tax profits as a percent of GDP. For the last five years, the Fed has been frantically pumping more and more money into Wall Street, keeping interest rates low to encourage hedge funds and other investors to borrow and speculate. This free money, and the resulting speculation, has helped drive stocks to their current very expensive levels. But now the Fed is starting to “take away the punch bowl,” as Wall Street is fond of saying. Specifically, the Fed is beginning to reduce the amount of money that it is pumping into Wall Street. To be sure, for now, the Fed is still pumping oceans of money into Wall Street. But, in the past, it has been the change in direction of Fed money-pumping that has been important to the stock market, not the absolute level. In the past, major changes in direction of Fed money-pumping have often been followed by changes in direction of stock prices. Not immediately. And not always. But often. Here’s a look at the last 50 years. The blue line is the Fed Funds rate (a proxy for the level of Fed money-pumping.) The red line is the S&P 500. We’ll zoom in on specific periods in a moment. But just note that Fed policy goes through “tightening” and “easing” phases, just as stocks go through bull and bear markets. And sometimes these phases are correlated. Now, lets zoom in. In many of these time periods, you’ll see that sustained Fed tightening has often been followed by a decline in stock prices. Again, not immediately, and not always, but often. You’ll also see that most major declines in stock prices over this period have been preceded by Fed tightening. Here’s the first period, 1964 to 1980. There were three big tightening phases during this period (blue line) … and three big stock drops (red line). Good correlation! Now 1975 to 1982. 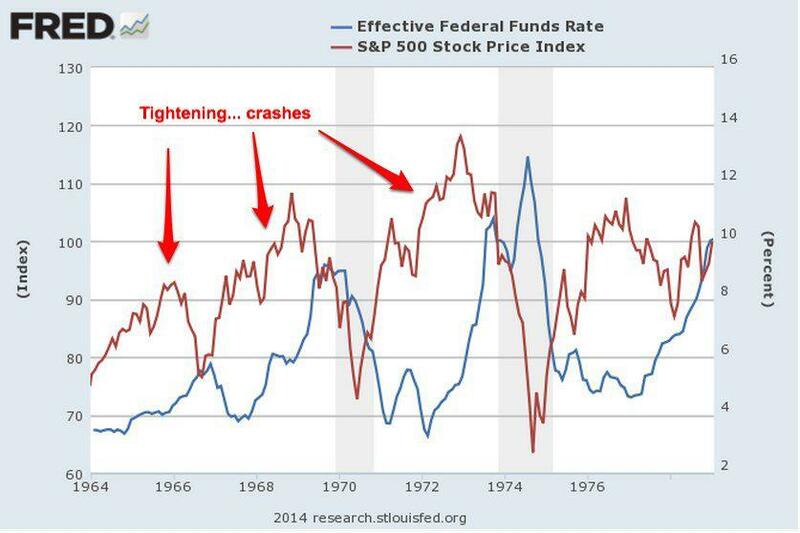 The Fed started tightening in 1976, at which point the market declined and then flattened for four years. 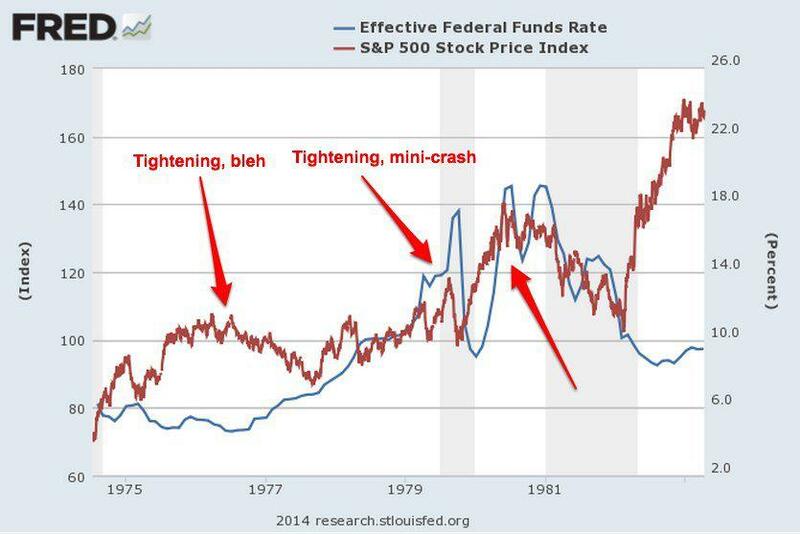 Steeper tightening cycles in 1979 and 1980 were also followed by price drops. From 1978 to 1990, we see the two drawdowns described above, as well as another tightening cycle followed by flattening stock prices in the late 1980s. 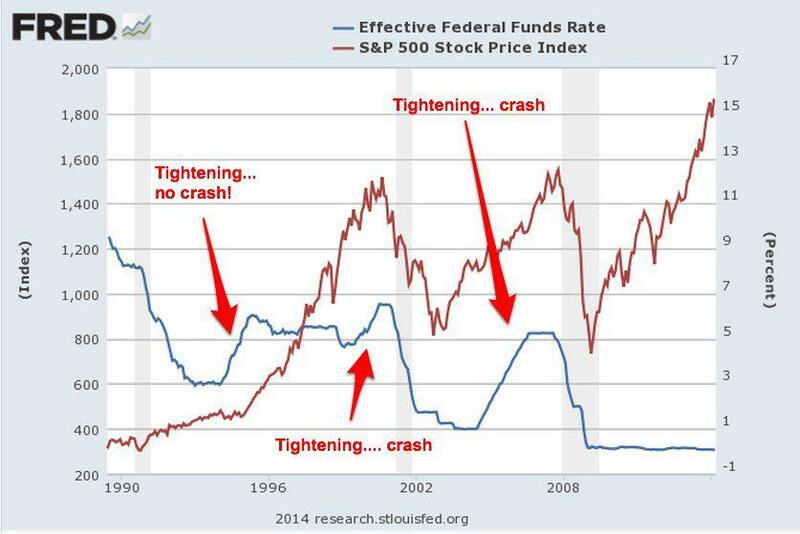 Again, tightening precedes crashes. And, lastly, 1990 to 2014. 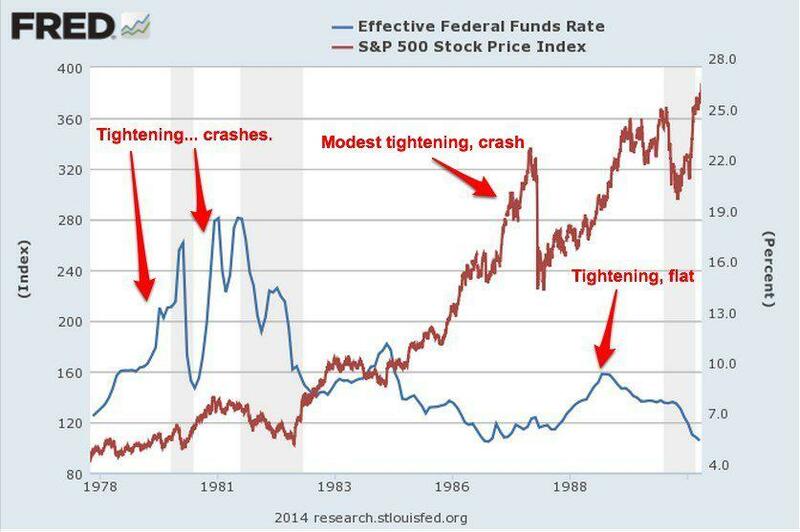 For those who want to believe that Fed tightening is irrelevant, there’s good news here: A sharp tightening cycle in the mid-1990s did not lead to a crash! Alas, two other tightening cycles, one in 1999 to 2000 and the other from 2004 to 2007 were followed by major stock market crashes. One of the oldest sayings on Wall Street is “Don’t fight the Fed.” This saying has meaning in both directions, when the Fed is easing and when it is tightening. A glance at these charts shows why. On the positive side, the Fed’s tightening phases have often lasted a year or two before stock prices peaked and began to drop. So even if you’re convinced that sustained Fed tightening now will likely lead to a sharp stock-price pullback at some point, the bull market might still have a ways to run. So those are three reasons why I’m still nervous about stock prices and think stocks will likely deliver lousy returns over the next 7-10 years — price, profit margins, and Fed tightening. I also would not be surprised to see the stock market drop sharply from this level, perhaps as much as 50 percent over a couple of years. None of this means for sure that the market will crash or that you should sell stocks (I own stocks, and I’m not selling them.) It does mean, however, that you should be mentally prepared for the possibility of a major pullback and lousy long-term returns. Because unless it’s “different this time,” that’s what we’re likely to get.